Oh Summer! How we love you in a unhealthy relationship type of way! Summer means lazy days, time to play, outdoor fun, special memories. Right? Well at least that's the hope we have that's formed from childhood. Summer vacation lasted for months! Frankly I find summer to be the busiest, least relaxing season. More yard work, more company, more events and obligations, more busyness and for me a lot less time to write, read, and catch movies. (I miss my winter weekends most of all!) And did I mention it was 87 inside my house most of yesterday? Ugh! A whole marketing trend is the famous "summer reads"... or 'what will you take to the beach?' 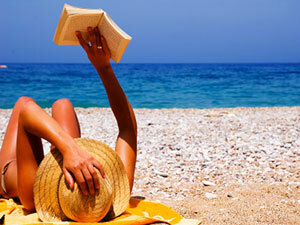 I often wonder just how few of us actually read more in summer, or sit on that beach with the latest bestseller! I really enjoyed CHAMELEON by Jillian Kent, currently reading CULLODEN SPIRIT by my crit partner Anita Davidson, and despite too many books on my Kindle and a super sized stack of paper in my TBR pile, I'm hoping to pick up VEIL OF PEARLS by MaryLu Tyndal. Oh, and I just finished 12 chapters of an Inky manuscript that you are all going to love when it gets published! Well, I used to laze on the beach and read when I was in my teens and twenties. Then I discovered that people were getting skin cancer and you're supposed to cover up. Since I don't like the lotions, and can't stand having my arms covered while in the sun, I migrated inside except for gardening and other outside work. Congrats to Diane and Susan for being 2012 Carol Award Finalists. I'm reading The Agency by Y.S. Lee. It's about a young woman who is hired as part of a super secret group of woman investigators. They specialize in taking on "invisible" roles like companion, nursemaid, etc. and of course solving crimes that stymie their male counterparts. Next up is A Company of Swans by Eva Ibbottson. (sp?) About a young ballerina who is hired as part of a troupe traveling along the Amazon and performing for wealthy plantation owners. I'm on a YA kick at the moment and trying to do some market research as I've been wondering if some of my stories might not fit that market better. Ugh. I hate summer. I don't like hot (and we have it HOT here in Texas) or sweat or bugs or dirt. Electric and water bills are exponentially higher in the summer. Give me spring, fall or winter any time! Sorry I've been a dud at responding... I just got online today for the first time. Hey, Jilly, glad you peaked in to see that I did include CHAMELEON! Anita- I did see that Diane was nominated! good for her! Lisa - those books sound great. I know I don't read enough mainstream popular fiction as I tend to stay in my writing genre too much and lately it's been taking me forever to get through a book! DeAnna, it's okay to talk about the weather. I am not a big summer fan either and our weather yesterday was probably what yours is like too often! For instance, you have to have Air conditioning where We can get by without it. ...for the most part. I can count on one hand the number of nights in a summer that it's too hot to sleep (sadly, we've already have them and it's not even August). Fun, Deb! I love going to the beach to read. Usually around here, I'm sitting in my car because it's too cold to sit on the beach itself. I am getting ready to read Dying to Read by Lorena McCourtney, DeAnna's book, and Maid of Fairbourne Hall. I just finished The Sherlockian, and right before that was Lisa Bergren's Glamorous Illusions (I loved it!). I'm going to check out the YA Lisa is reading. It sounds super good. Vitamin D is good for you. I'm all for a healthy beach tan, just be careful not to burn. I love to read in the backyard on the porch swing in the summer. The beach can actually be a little hot for reading here, and I'm usually with people and have a lot of distractions. I've read a few fun books so far this summer. They were all great books. Lately if I book isn't great, I just stop reading after a few chapters. Probably the most fun for a summer was Making Waves since it takes place at a summer resort.